Julie Mentor shares her journey in the field of development as the fourth and final interviewee of our Women’s Month series, which aims to celebrate the lesser-known women in the sector making an impact where they are, with whatever resources they have. Hi Julie, please tell us a bit about yourself. I’m a very proud wife to Terence and mom to two very sweet and busy little boys – Liam, who is three and a half years, and Eli, who recently turned two. 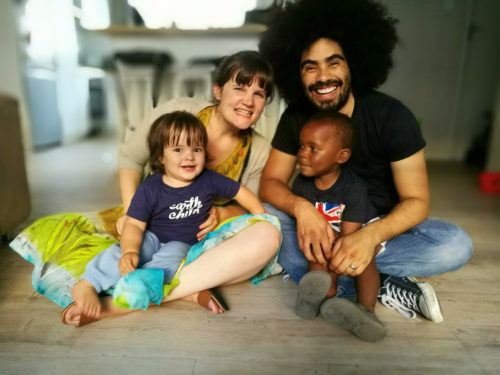 I am currently the Project Director for Cape Town Embrace, a movement primarily focused on building social connections for families, especially mothers, during the first 1000 days of their children’s lives. My journey in the development sector has been an interesting one. After studying film and media, and English literature at University, I joined an ECD NPO as the communications officer. Naive to the world of development, my experience in the sector gave me solid grounding, but I think development is something you live and breathe. My nickname in high school was ‘Mom’ (it probably wasn’t always complimentary!). I have spent much of my young adult life circling around that word – first as a temporary safe care mother (Kangaroo Mom) for babies in crisis or awaiting adoption, before stepping proudly into the role as a mom through adoption to my precious Liam Siyabula, and soon after in child birth with Eli Jack. My personal journey as a young mother has grown with my work at Embrace and I’m incredibly grateful that my work mirrors my personal life so well. My work allows me to meet the most incredible and inspiring women – I meet at least one such woman a week where I leave our meeting feeling encouraged and re-energised. It sounds clichéd, but my fellow mothers really do inspire me. I’ve met young, single mothers who put their babies to sleep at night and then stay up until the early hours of the morning studying, to complete their schooling. I’ve met mothers who have made hard choices and live thousands of kilometers away from their children in order to work and provide for them. I’ve met mothers who cry through painful nursing sessions, and yet persist in order to give their babies the very best. I have watched fellow mothers battle post-natal depression with determination and strength. I have watched women rally around each other even though they are all equally exhausted and in the trenches of motherhood, and I cannot help but feel privileged to be privy to this incredible world of brave and beautiful mothers. This is a hard one for me to speak about, but I think I’m starting to feel proud that I’ve ‘stayed the course’ with my work, even when it’s been incredibly tough and I’ve literally been the last person standing in the office. I have had a few enticing opportunities to pursue careers that have appeared ‘easier’, but I feel that God has blessed me with certain skills and characteristics and I need to develop those to the best of my ability to make a positive difference in this world. Julie was nominated for her huge passion and heart for fellow mothers, and her enormous courage to tackle challenges that no one else has dared to.